If you are stumped about what to buy that “Dog Lover” on your holiday shopping list, look no further than these 4 unique items that are sure to help you get your shopping finished this year. This handmade and personalized bronze colored dog tag is about 1″ in size and has an antique soup bone in the center, plus the company who makes them also donates a portion of their proceeds to “furkids” in need so everybody wins with this purchase. Some of the recipes in this Dog Biscuit cookbook sound almost good enough to eat yourself, since they are made from scratch and use many things that you might already have in your kitchen or that can easily be obtained from almost any grocery store. This handmade 8 foot dog lead provides lots of options for dog training, tying or just helping you get more hands free when you are trying to manage a stroller and your pooch all at the same time. 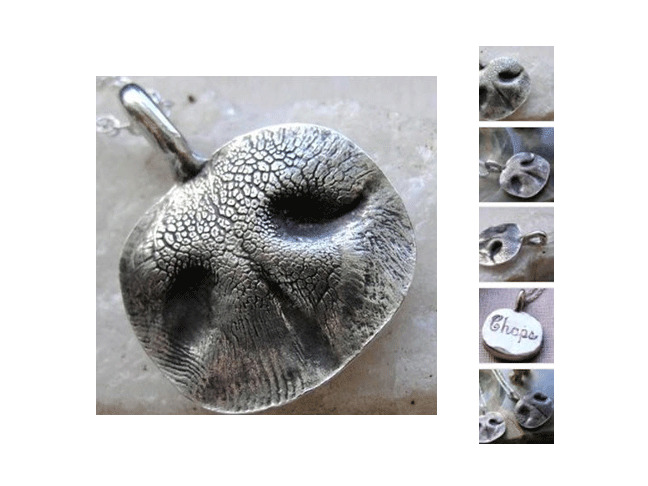 This darling sterling silver nose print is an actual personalized mold of your very own pet’s nose (don’t worry, taking the actual mold print only requires a few seconds) and it can be made into either a necklace or a key chain so you can always keep your pet close to you. Personalized molds of your dogs paw prints are also available too! Full List Of The 2012 Screen Actors Guild Awards Nominees Announced‘Alvin And The Chipmunks: Chipwrecked’ Opening December 16!